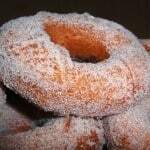 Culinary confession: I love old fashioned doughnuts so much that I don’t even mind if they’re stale. In fact, a slightly stale doughnut dipped into coffee, in my opinion, is an under-appreciated delicacy. 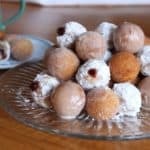 These doughnuts are a classic cake doughnut. The outside is crisp and the interior is soft, tender, and just lightly scented with nutmeg. 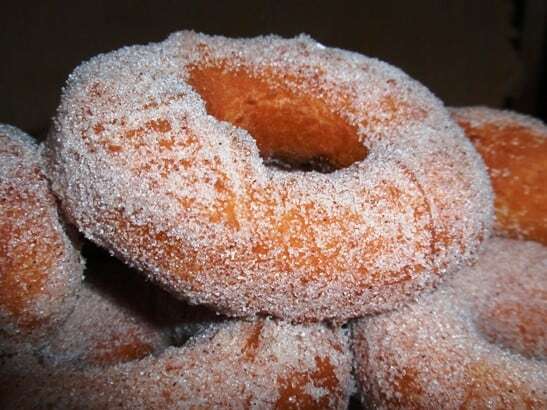 Roll these doughnuts in cinnamon-sugar or leave them plain. They are great either way. 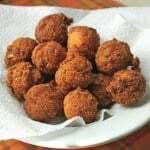 Prepare the Topping: In a small bowl, combine the granulated sugar and ground cinnamon for rolling. Set aside. 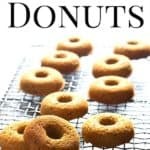 Make the Doughnuts: Whisk together white rice flour, potato starch, tapioca starch, granulated sugar, baking soda, baking powder, salt, xanthan gum, and nutmeg. Add egg and buttermilk. Mix until a dough forms. (Use medium-high speed on a handheld mixer and medium speed on a stand mixer.) Dough will be thick and sticky. Generously white rice flour your counter. This dough is sticky. So, you need a good amount of white rice flour on the counter to prevent it from sticking. Place cut doughnuts on a lightly white rice floured baking sheet. Fill a fryer according to manufacturer's directions. Heat oil to 375 degrees. Depending on the size of your fryer, fry one to three doughnuts at a time. 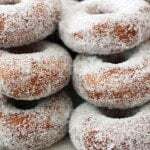 It is better to err on the side of frying fewer doughnuts. This will keep your oil hot and your doughnuts won't get greasy. After one minute, flip doughnuts over and fry until each side is golden brown. Using a heat-safe spatula, remove doughnuts from the hot oil. Drain on paper towels and toss into cinnamon sugar mixture. Repeat. And be sure to use the doughnut dough scrapes for doughnut holes! Don't let it go to waste. Can I use an all-purpose gluten-free flour? I have a white rice blend all=purpose gf flour. As long as it contains xanthan gum, it should work! Does it work if we use coconut flours instead of rice flours? No. Coconut flour can’t be used to replace a grain-based flour.